Around the World with Auntie Mame by Patrick Dennis is a delightful continuation of the earlier, more widely known book, Auntie Mame. This book begins with Patrick and his wife wondering what has become of Auntie Mame and their son who have been on a “short” trip of their own for over two years. In this story, Patrick recounts a long overseas vacation taken with his irrepressible Auntie Mame during the summer prior to his entrance to college. The cast of international characters and Auntie Mame’s antics are comical. I enjoyed this book almost as much as the original and still wish I’d known Mame personally. Her joie de vivre is enviable! This entry was posted in Uncategorized and tagged Around the World with Auntie Mame, Auntie Mame, Books, Patrick Dennis. Bookmark the permalink. 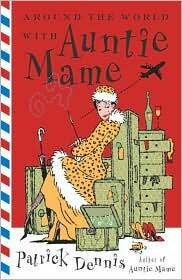 i read Aunti Mame years ago & loved it – must see if I can hunt up a copy for a re-read. Thanks for jogging my memory. One of my favorite movies too! I recommend Dealoz.com as a good site to look for older books. Enjoy!